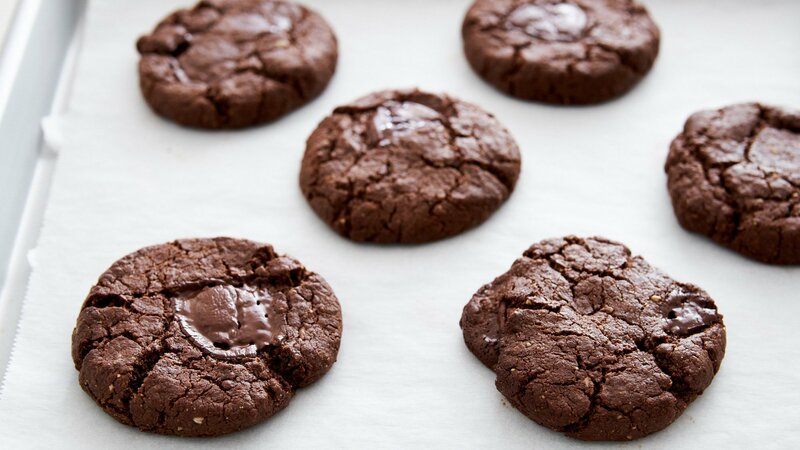 Crisp on the outside and soft and chewy on the inside, no one will ever guess these decadent chocolate cookies are plant-based. 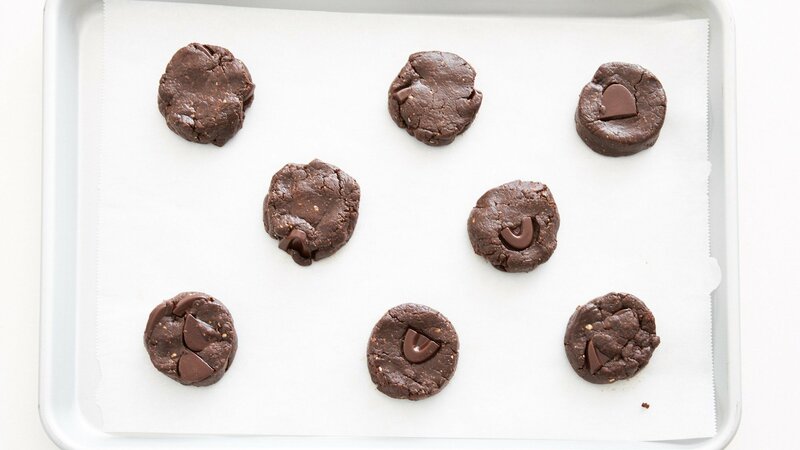 With loads of chocolate chunks and almond butter, these vegan cookies are rich, decadent and hard to resist. I'd even go so far as to say these are simply the best chocolate cookies regardless of your dietary preferences. Although I admire people who can adhere to a strictly vegan lifestyle, it’s not realistic to get everyone to change their eating habits overnight. I’ve long believed that the way to get people to follow a more plant-based diet is to make vegan food materially better than the conventional alternative. By better, I don’t mean esoteric ideas like being kinder to the world around us or being healthier, but better in an immediately apparent way such as better taste or easier preparation. 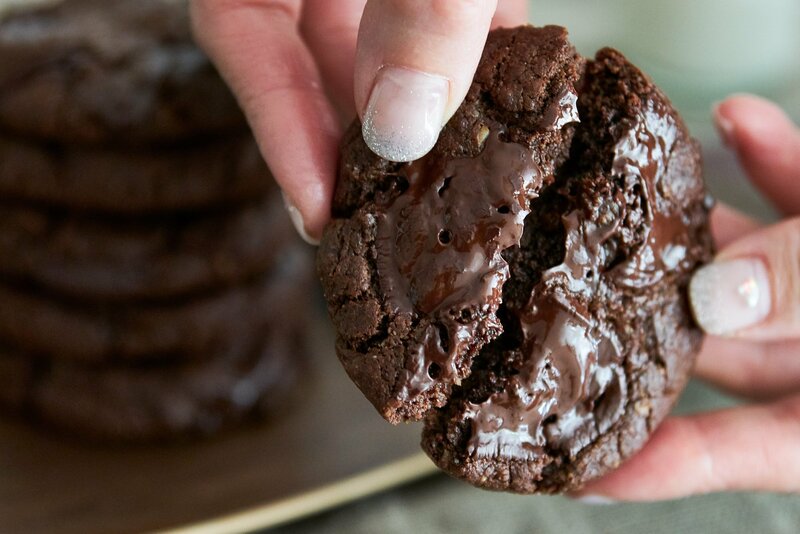 I’ll let the pictures do the talking, but these are probably the best chocolate cookies I’ve ever eaten, and they take about 15 minutes to make. If that’s not materially better, I’m not sure what is. I’ve been experimenting with vegan cookies for a while now, and I’ve even come up with a few that were good enough to replace their conventional counterparts. 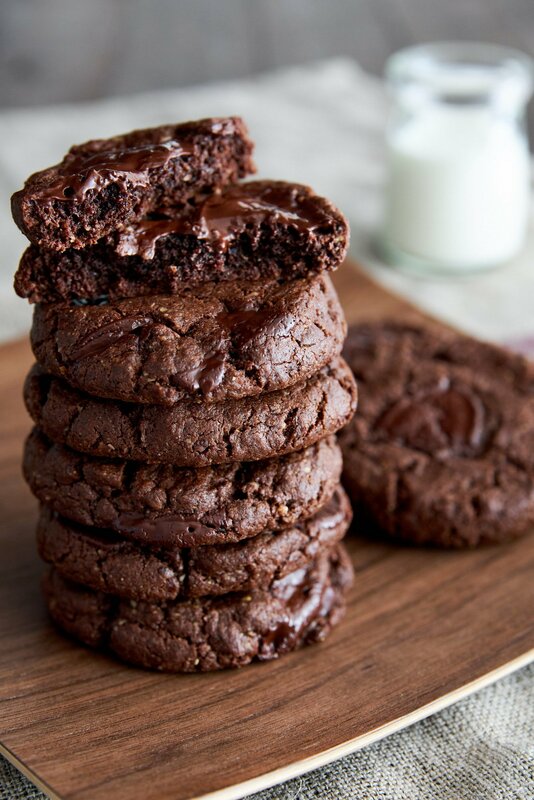 For these chewy chocolate cookies, there are two tricks I’ve come up with that gives them an amazing flavor and texture while making them easier to make. The first is to replace all the butter in a conventional cookie with almond butter. The almond butter gives each bite of cookie a rich, creamy mouthfeel along with the wonderful toasty fragrance of roasted almonds. I’d be lying if I said that this makes these cookies healthy, but the almond butter loads them up with fiber, protein and minerals, making them far less bad for you than they taste. To get the awesome chewy texture, I use two ingredients. The first is oatmeal, which gets ground up before the almond butter goes in. If you like the rough texture of oatmeal cookies you can grind them a little less, or if you want a finer texture you can grind them into a flour. 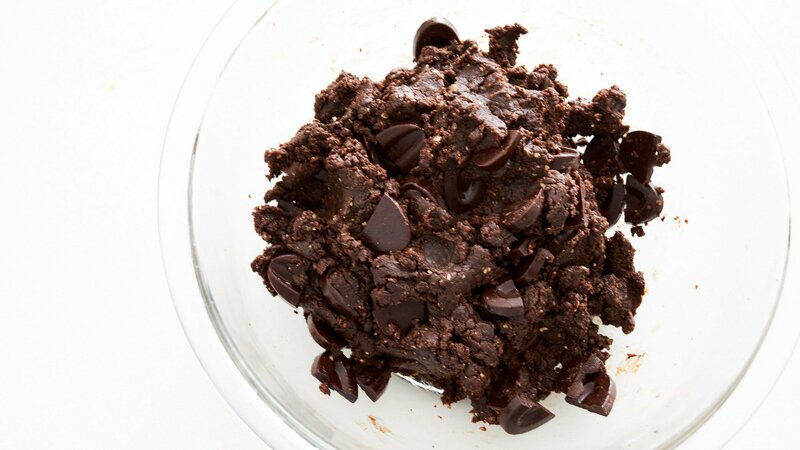 Either way, the oats lend a wonderful chew to the cookie while contributing additional fiber, proteins, and minerals. To get them even chewier, I add brown rice syrup. This is a type of sugar consisting mainly of maltose, which has the texture of cold honey. It gives the cookies a wonderful chew and a malty flavor that’s reminiscent of Ovaltine. When mixed together this cookie dough smells and looks like soft Tootsie Rolls, and since there are no eggs, you can eat the raw cookie dough without worrying about food safety issues. Like all cookies, you can adjust the degree of chewiness versus crispness by reducing or increasing the time in the oven. At 8-9 minutes, they should turn out crisp around the edges and chewy on the inside. If you cut that time down to 7-8 minutes, they will be more chewy and tender, and if you increase it past 9 minutes, they will become crisp. Just be careful not to burn them as the cookies are dark, to begin with. Because there is so little flour in these, you could probably make these gluten-free by replacing the all-purpose flour with an alternative. I haven’t tried it yet, so I can’t make any promises, but if you try it, leave a comment and let us know how it goes. Preheat the oven to 350 degrees F (175 C). Line a baking sheet with parchment paper or silicone mats. 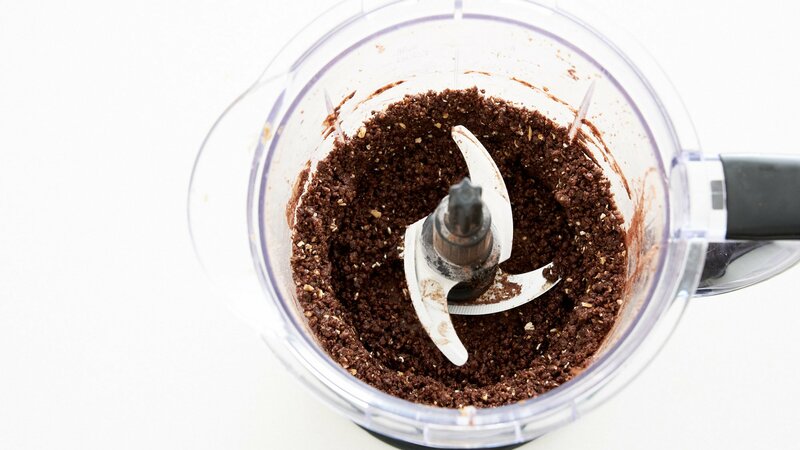 Put the rolled oats, flour, cocoa powder, coconut sugar, baking soda, and salt into the bowl of a food processor and process until the oats are ground into a rough flour. Add the almond butter, rice syrup, and vanilla and process until a crumbly dough forms. With the food processor running, add the water and process until the dough comes together. Shape the dough into balls, and place on a parchment paper-lined baking sheet. Flatten with your fingertips. For 9 to 10 minutes, until the edges are crisp, but the center is still a little soft. Cool the cookies on a rack before trying to remove them from the parchment paper.